Aww! Are you thinking of leaving us? We're sorry to see you go, but if you have any questions or feedback please send us a chat message so we can help. You're apart of our Tailwind family and we want to keep it that way! If you cancel in the middle of a billing period, you will continue to have access to that plan for the remainder of the period you've already paid for, but you will not be charged again for your authorized renewal. No refunds are provided for canceling during a subscription period. 2. Click the account you want to cancel the Plus subscription on. 3. Click the "Change Plan" button at the top right of the Account box and choose, "Downgrade" . Important: If you change the plan for one account, this change doesn't actually change the plan for any other account you have added! If you want to completely stop billing, please make sure you downgrade all accounts! 4) On the Confirmation page, you will see all the details related to your plan moving forward, how many days you have left until the cancellation is finalized, and what changes will happen to your account once the plan has been cancelled. Click "Downgrade My Account". 5) Finally, we would love it if you would share any feedback you have about what made you decide to cancel. 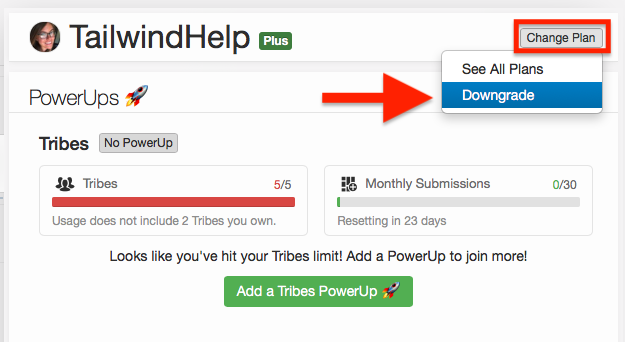 This is completely optional, but what you have to say will help us keep improving Tailwind!